Los Angeles, CA (April 9, 2010) – Southern California-based boxing fans of world heavyweight title contender – and Riverside’s own — Cristobal “The Nightmare” Arreola can see him interviewed live on the KTLA-TV5 Morning News this coming Monday morning, April 12. Arreola’s interview will take place during the 8:00-8:30 AM segment. Tune in, watch and listen as the always-entertaining Arreola discusses his upcoming battle versus Poland’s Tomasz Adamek in the “RING OF FIRE” main event set for Saturday night, April 24th at the new state-of –the-art Citizens Business Bank Arena in Ontario, CA. The 29-year old Arreola, who came up short against WBC Heavyweight Champion Vitali Klitschko in his attempt to become the first fighter of Mexican descent to win a World Heavyweight Championship last year, is on the path to another opportunity at realizing his dream. A win over Adamek – a former World Light Heavyweight and Cruiserweight Champion, who is undefeated as a heavyweight – puts Arreola nose-to-nose with boxing’s best trash talker today, WBA Heavyweight World Champion, David Haye of England. 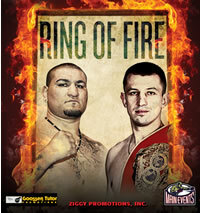 Tickets for “RING OF FIRE” are priced at $250, $100, $70, and $35 and are available at Ticketmaster.com or at the Citizens Business Bank Arena Box Office. For more information please visit CBBankArena.com. Citizens Business Bank Arena, built and owned by the City of Ontario, operated by AEG Facilities, includes 9,500 fixed seats with additional “portable” seating risers to accommodate capacities of 11,089 for concerts, 9,736 for ice hockey and 10,832 for basketball. The 225,000 square foot venue features 36 luxury suites located on two levels and a continuous concourse hosting a variety of refreshment stands, merchandise kiosks, a VIP club and other fan amenities. The venue is the biggest and most modern arena within the Inland Empire, an area with over 4.1 million people. It is located in the City of Ontario, on a 37-acre parcel located between Haven Avenue and Milliken Avenue, Fourth Street and the I-10 Freeway.